Please note: Each Marco Bicego piece is unique and actual stones used may vary. Marco Bicego bracelet from the Paradise Collection. 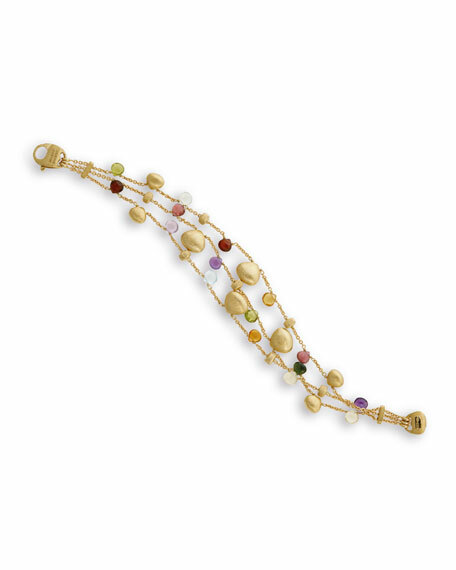 Multicolor, faceted semiprecious stones adorn ends; may include tourmaline, quartz, peridot, rhodolite, garnet, iolite, tanzanite, aquamarine, apatite, topaz, citrine, and amethyst. Created in 2005, the Paradise Collection became an instant success that continues to dazzle. Swimming in the Mediterranean waters of the Sardinian coastline, Marco Bicego found inspiration in the chromatic and crystalline reflections of sunlight to design this young and whimsical collection. Shimmering rose and white quartz complement an infinitely delicate range of aqua blue and green semiprecious gemstones. A joyous mix of delicate golden chains, tiny hand-engraved golden beads, and colorful gems join together to create another iconic collection. Crafted exclusively in hand-engraved or hand-twisted 18-karat gold, diamonds, and semi-precious jewels, Italian jewelry designer Marco Bicego is known for creating luxurious and easy-to-wear jewelry. Impeccably edited for, as Marco says, "the beach, the boardroom or the ballroom," these pieces become effortless and essential staples of your jewelry wardrobe perfect worn alone as a statement, or even better, layered for added impact. Capped hinge bracelet by Alexis Bittar. 10-karat gold plated brass hardware. Hand-sculpted, hand-painted Lucite®. Crystal accents details end caps. Hinged opening eases dress. Approx. 0.5"H; 3"W.
Vanitas leather buckle bracelet by Alexis Bittar. Gunmetal-plated brass with genuine leather. Mixed skull, hand and butterfly embellishments. Pyrite, morganite crystals and apatite doublets. Hinged opening with buckle closure. Approx. 1"H; 2.5"W.
John Hardy bracelet from the Classic Chain Collection. Signature sterling silver hardware with woven chains. Small chain with double-link station.